Each course will dig deep into current community issues and be taught by professionals who are currently leading projects throughout Los Angeles. This fall, students in the Nonprofit Management Academy will get an Introduction to Community Economic Development from CDTech’s President and CEO, Benjamin Torres. 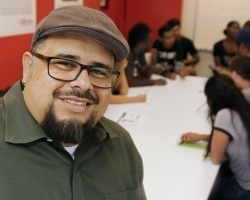 Benjamin Torres is the President and Chief Executive Officer of the Community Development Technologies Center (CDTech), a 501 (C)(3) nonprofit focused on addressing issues of racial equity and economic justice in low-income areas of Los Angeles through a social justice lens that empowers residents to lead the process of their community’s stabilization efforts. Benjamin’s entire career has been focused on placing the tools of democracy directly in the hands of society’s most marginalized residents through education, training, engagement and multi-cultural, multi-ethnic, multi-linguistic community building. For the last 21 years his voice and leadership have supported the South LA region’s Black/Brown neighborhoods to increase their social capital and economic opportunity through inclusive democratic and power building action and the strategic utilization of highly effective public, private, nonprofit and resident partnerships. Benjamin has been with CDTech since 2002. Prior to his appointment by the board in 2010 as CDTech’s President and CEO, Benjamin served as the Vice President of the Working Democracy Division and Director of CDTech’s Community Planning program at Los Angeles Trade-Technical College (LATTC); the MultiCultural Collaborative’s Community School Initiative in Watts; and, the Multi-Cultural Education Consortium in Santa Barbara. Born to immigrant Mexican parents and raised in LA, Benjamin Torres embodies the new executive leadership in California’s nonprofit sector, encompassing the vision required to address changing demographics in South Central LA with a unique message about equity, social justice and economic empowerment that actively engages African Americans, U.S.-born Latinos and immigrants. His groundbreaking work in building, supporting and sustaining effective coalitions has resulted in: (1) award of several community benefits agreements re-invested in housing, health services, workforce and small business development, (2) the establishment of the CD-9 Coalition with over 25 multi-sector stakeholders working in partnership to develop a culture of collaboration in the District, and (3) the establishment of the LA Community Organizing Academy as an institutionalized training model that enables emerging/established grassroots leaders to gain the skills needed to change systemic conditions at the local, state and national levels. He has developed programs in the area of community capacity building and leadership development and served as technical assistant and trainer to their community outreach efforts with an emphasis on building grass-root African American and Latino leadership cadres. He is committed to building leadership capacity in South Central Los Angeles and serves on the Board of Directors of key organizations; Strategic Concepts in Organizing and Policy Education (SCOPE), T.R.U.S.T. SLA and the For Chicana/o Studies Foundation. He serves as a City of LA Commissioner on the Community and Family Services Commission and he also serves on the LA County Public Health Equity Task Force Commission. Benjamin lives in Echo Park, where he proudly grew up and lives with his long-time partner Dr. Juana Mora and his daughters Aurelia and Camila Valentina. and real estate development; and business and labor force development strategies used to revitalize urban neighborhoods.